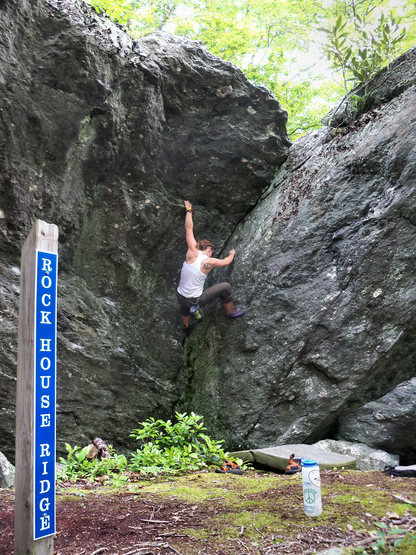 This week’s POW (Problem Of [the] Week) covers the short but stout “Dark Horse” (V7) on the Rock House Boulder in the Picnic Area of GHSP. 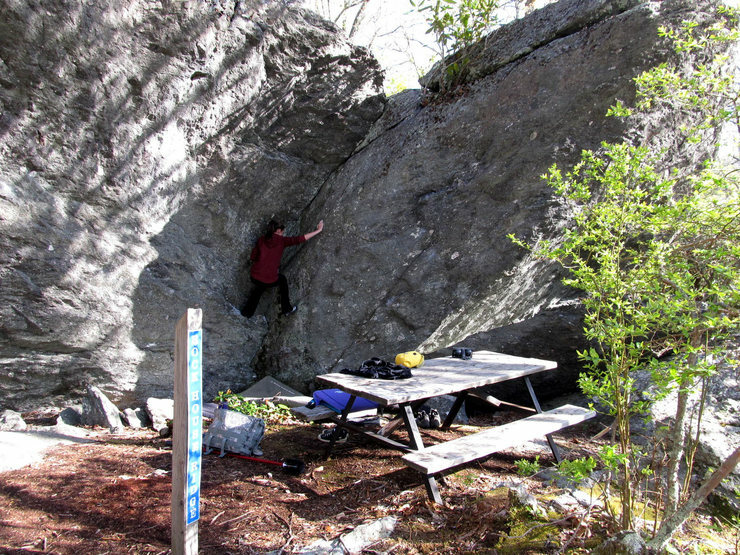 Dark Horse is a medium height boulder problem covering about 5-6 moves and climbing roughly 13+ vertical feet from the start. 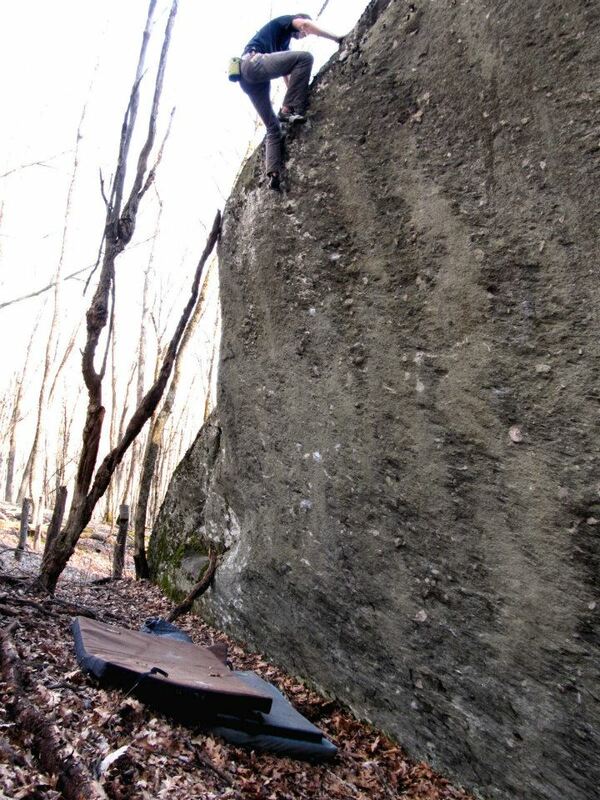 Dark Horse starts matched on a thin flake crimp rail at the base of the right “blade” of the Rock House Boulder (about 6 feet to the right of the “Cherokee Dihedral” problem covered in an earlier POW). The starting feet are basically nonexistent and you bicycle the lower arête of the boulder to begin. The first move is fairly big, but not reachy, to a small in-cut gaston. After latching the gaston, a few bleak foot switches across small dimples allow you to gain a higher left hand edge. At this point, huck up to a monster jug ledge and compose yourself a bit before moving on. I recommend going up to the top of the boulder and chalking holds from above, as the top crimps that are nice to use look identical to horrible ripples (blindly tossing to bad holds until you find what you are looking for can be pretty tiring/frustrating). From the huge ledge, make a substantial stab to another nice crimp, and then gain the slot/crack/seam-jug. 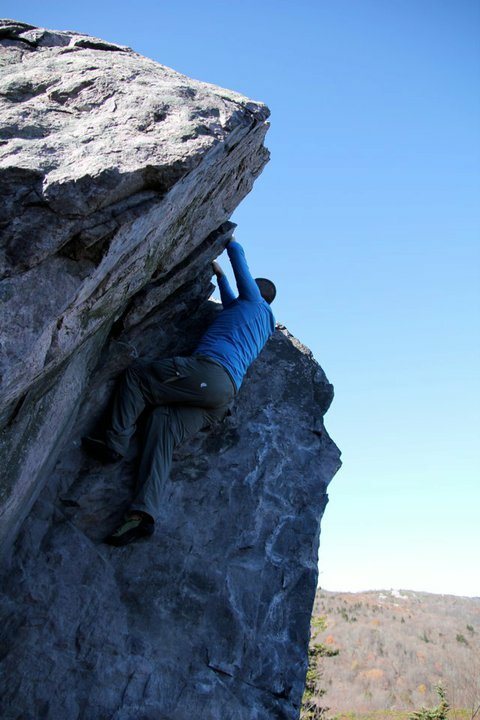 Toss to the top of the boulder to the left, finishing with absolute ease at the dihedral’s corner (the top to the left is juggy all the way across). Dark Horse, as with all other problem names on this boulder (with the exception of “mountains majesty (v7) which is not in the guide, and really isn’t worth doing whatsoever unless you have exhausted all other possible boulder problems… in all of GHSP), refer back to the Native Americans that used this boulder as shelter. Be sure to stop by the Rock House Boulder while visiting GHSP. Dark Horse is one of many awesome lines to be climbed on this block, and is amongst several classic and easy to access problems in the Picnic Area. 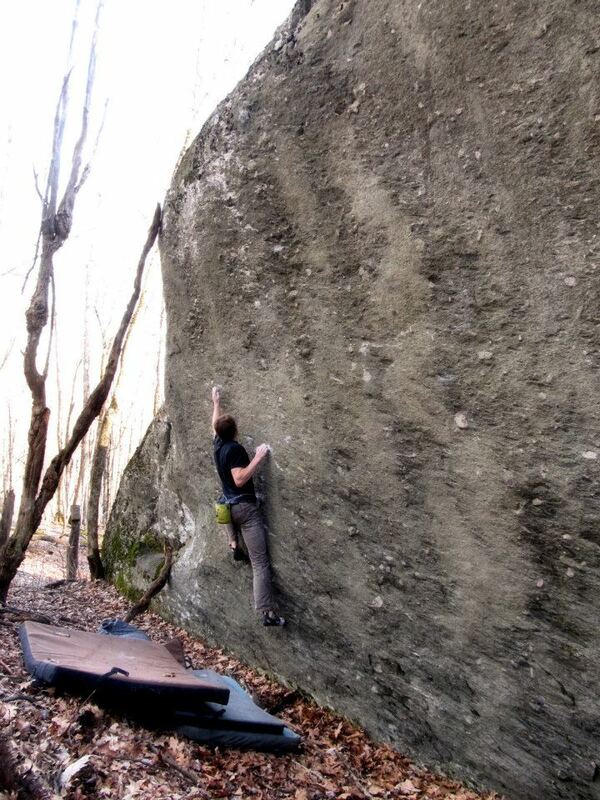 This week’s POW (Problem Of [the] Week) covers the fun and pumpy “Narco Crack” on the Crooked Road Boulder. The Crooked Road is a less traveled, tricky to find but easy to access, massive and steep boulder near the entrance of the park.The rock type for this boulder is different than most other boulders you will find in GHSP. It is still metamorphic sandstone I believe, but it is of a different composition. The main face is tall enough to satisfy most climbers but the left portion’s height is ominous and super highball. The entire boulder is steeply inclined, dark (faces away from the sun and toward the hillside, and its overhung nature casts a near constant shadow which is super nice in the summer), and fairly well featured. Narco Crack is on the right main face. The climb is steep, but follows good hands and interesting moves to a tall but confident top-out over a safe, pad friendly landing. There are two prominent cracks on the main face of the Crooked Road Boulder and Narco follows the right crack from the low sit start. The beginning few moves, which at first seem reachy but there are numerous beta sequences that work for shorter boulderers, are crux and lead into massive jugs further up. Narco crack, due to its steepness, can be pretty pumpy but the quality hands and large holds up high make it easy to work. The line is straight forward and begs to be climbed. just sit start and follow the crack past featured hands to the easy top-out. At the top of the line the top-out is more of a scramble and the view is nice and worth taking a moment to enjoy. Be sure to check out “Johnny Get Your Gun” “Life Is A House” and “Rosewood Casket” while you’re here! 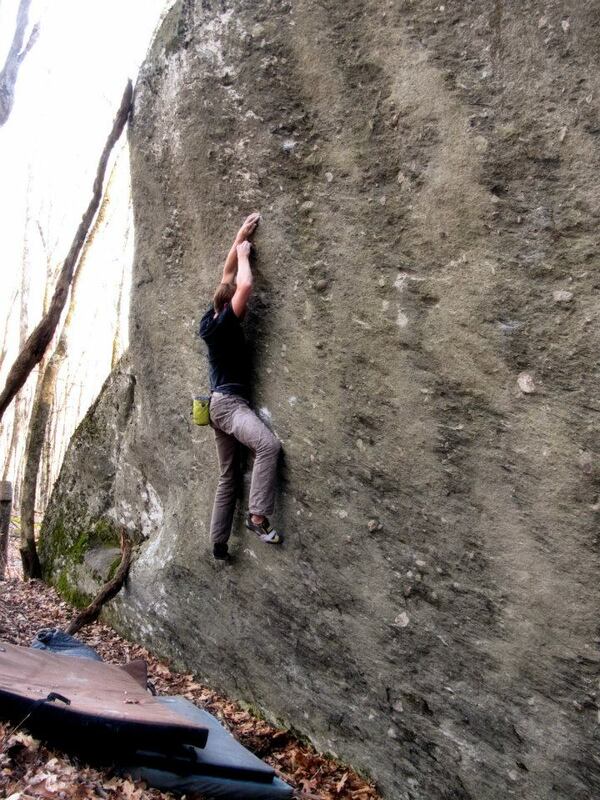 This Problem Of [the] Week (POW) is all about “Gunslinger” (V7) in the Right Boneyard area of GHSP. Gunslinger is low-ball, burly, and three moves long. Five moves long if you count starting and topping it out (which I would, as neither are particularly easy). The problem starts low on a small, steep, knife-blade arête fin. Shane Messer (the first ascensionist) and I found this line to be worthwhile by simply trying to start it, and considered naming it the “thigh master” due to the squeezing necessary to get off of the ground. To begin Gunslinger you start matched on an impossible looking, barely present, horribly slopey, feint bulge on the left side of the boulder. Your thighs have to “steel trap” either side of the acute arête, squeezing like you’re trying for that shiny dinner-plate sized rodeo belt buckle of your dreams, and with feet anywhere you can manage them. From the start you bump to the right twice and follow through with your left to establish on two equally terrible sloper lumps. This is followed by the “gunslinger move” which is a large, fleeting, Hail Mary toss to the nice fin jug at the tip of the boulder (and avoiding the deal breaker dab on the adjacent boulder as you orbit out). From there, a toss over mantle press-out gives way to victory. The landing is good and the problem is lowball, but you probably want two crashpads just to cover the bases. 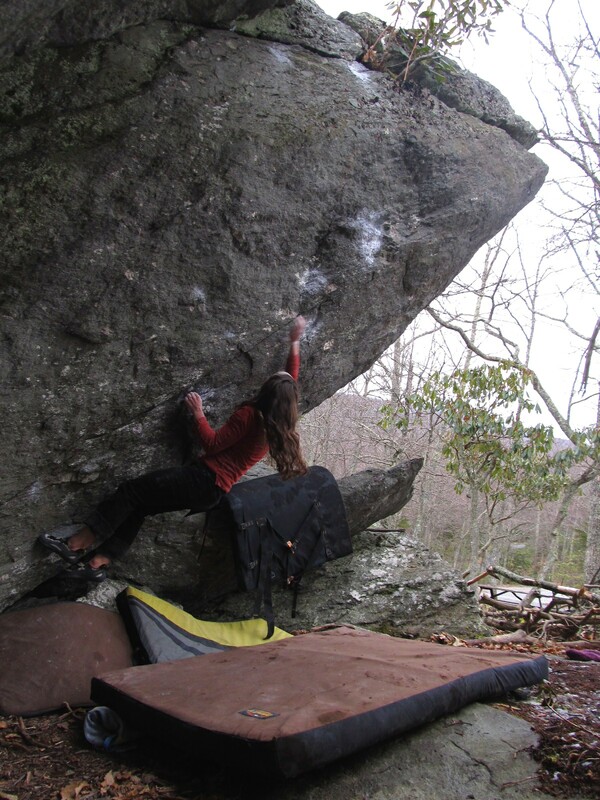 Shane Messer put this one up on 11 March 2011 and aptly named it, as this one has sent many a climber out onto their crashpad. Be sure to give Gunslinger a go if you’re ever in the Right Boneyard. 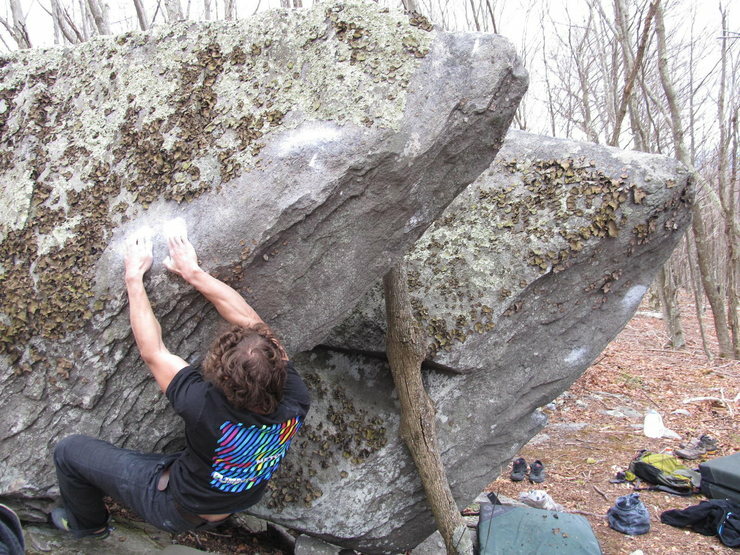 Regardless of what category you lump short three-move problems into, I think you’ll be psyched to top this one out. 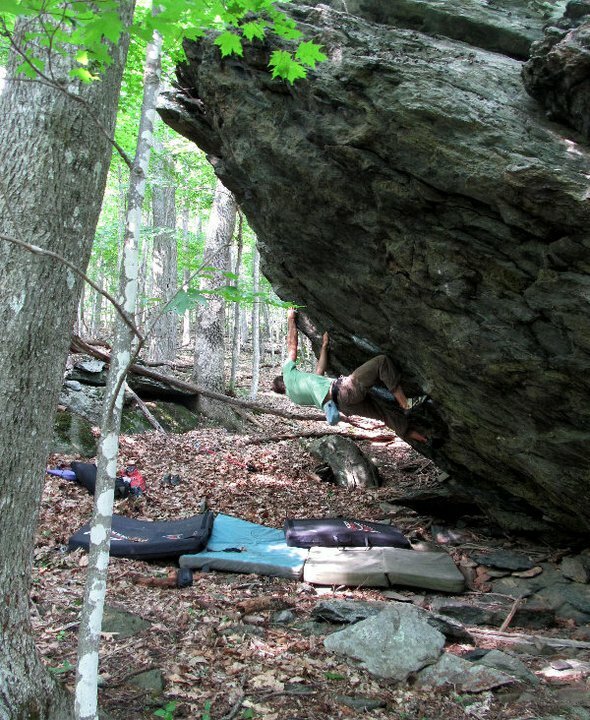 This POW (Problem Of [the] Week) is all about “Never Have I Ever”(V5) located on the Equinox Boulder that can be found in the clandestine Luminary Area of GHSP. This area is still relatively unknown and will not be covered in this first edition guidebook due to a lack of trails and thorough documentation, but the second edition will cover it in its entirety. I think some of the best boulders in GHSP exist here. Never Have I Ever is a technical boulderer’s dream-come-true. The line forces tricky movement and body tension over its intricate finger tip crimps and slightly over-hung face. Additionally, the line ascends 15+ feet to a finish move that gives the climber full appreciation of how lofty the top of the boulder actually is. Never Have I Ever starts low on crimp rails (half pad) and commences through a beta intensive sequence past progressively “less juggy” crimps than the ones before. 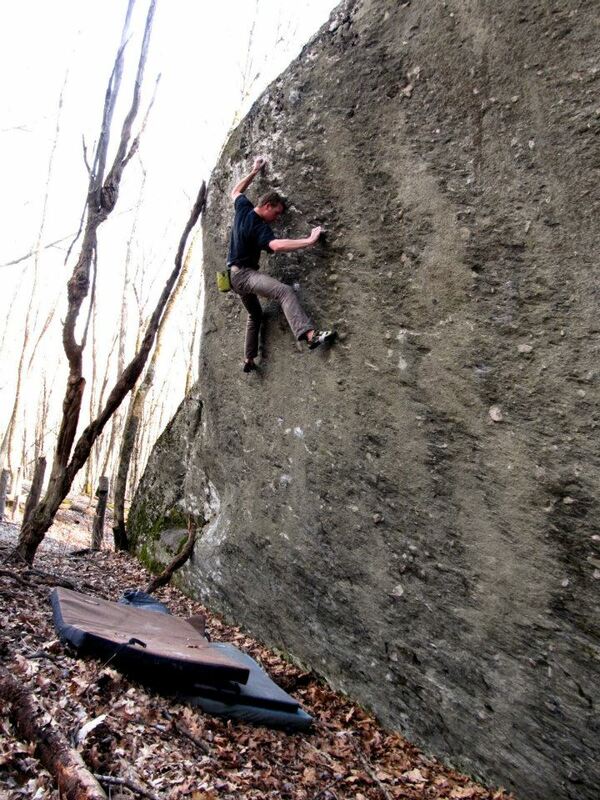 Eventually you hit the crux section that necessitates a cross-over on the worst crimps in the problem. These crimps are a quarter pad at best and on slightly overhung territory (at other boulderfields this inclination would be considered pretty damn steep). Once out of the cross over, good body tension gets you to larger rails for the final huck to the only jug on the entire face. Topping out Never Have I Ever is probably around 18+ feet. The landing is very nice however, and with enough pads this will feel like a walk in the park. This problem gets its name from the drinking game “Never Have I Ever” that most everyone has played at some point (if you haven’t, you’re not really missing out on much). 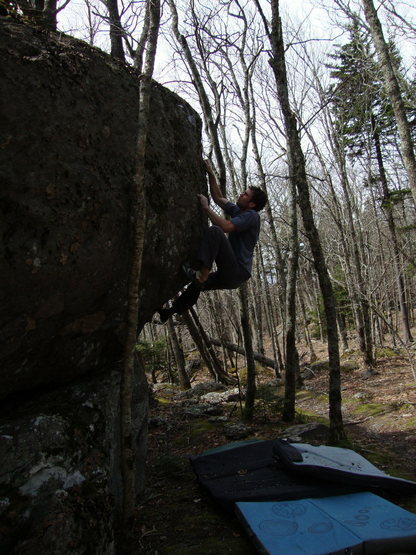 While cleaning and climbing this problem during spring break (2012) I only had one pad and no spotters (and this was an undeveloped, unknown boulderfield in GHSP at the time). 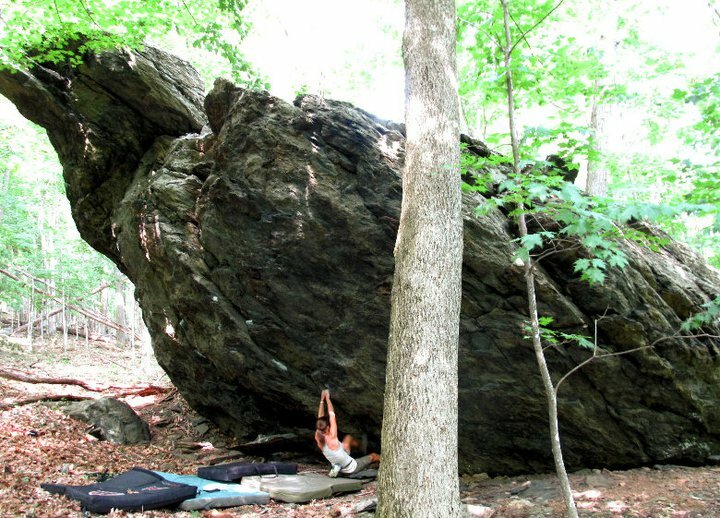 This POW (Problem Of [the] Week) is all about the awesome “Cherokee Dihedral” (V1) on the Rock House Boulder in the Picnic Area of GHSP. 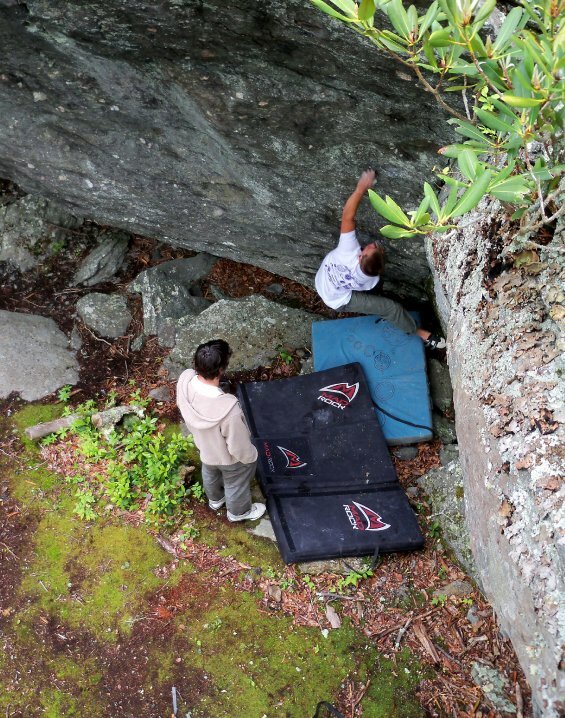 Most everyone who has visited the Picnic Area of the park has spent a little time on this problem, and for a few folks this has even been their very first outdoor V1. I wish I could say that my first V1 was as awesome as this. 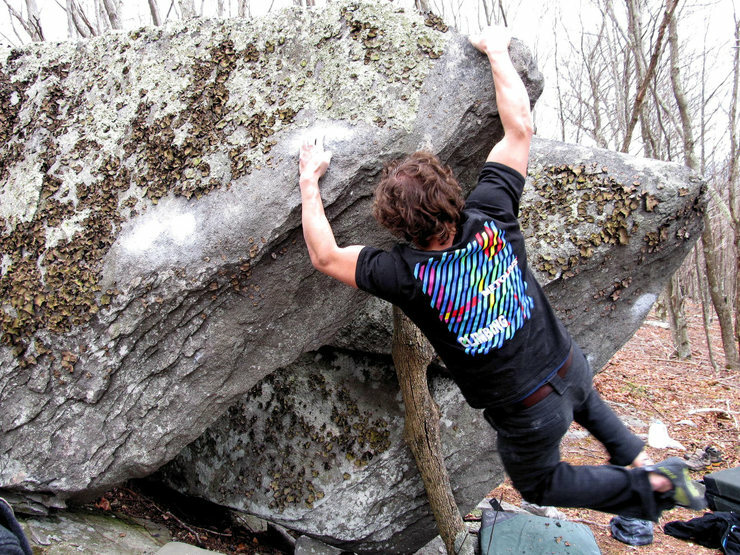 Cherokee Dihedral is a tall, exciting, full value boulder problem that can be accomplished by using any one of the numerous beta sequences that work to suit most any climbing style and wing span. Most everyone gets to span, layback, and skate feet while attempting to reach the “glory” jug crack below the lip of the boulder. 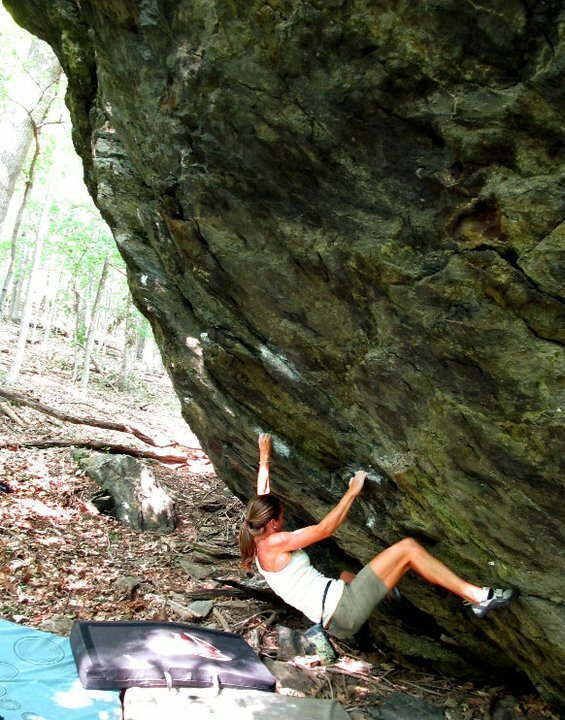 One of the many perks of a session at the picnic area and the Rock House boulder is that you get to be lazy. Very lazy. The Rock House boulder is literally an easy stone’s throw (effortless toss really) from where you park, and the approach may take 30 seconds if you’re really dragging your feet. Additionally, there is a nice picnic table thoughtfully situated beside the boulder, so those of you who have really fancy gear don’t even have to get it dirty by laying it on the leaves (heaven forbid). If this isn’t enough, several camp grills are set up nearby the boulders. so hey, why not bring steaks for an after session victory meal? Cherokee Dihedral starts low on a massive jug and works up several similar large holds as the face becomes progressively steeper. A transition over to the right face and a cruxy foot switch/slide/swing to a better foot ledge to the right gets you into the “glory crack” jug holds. 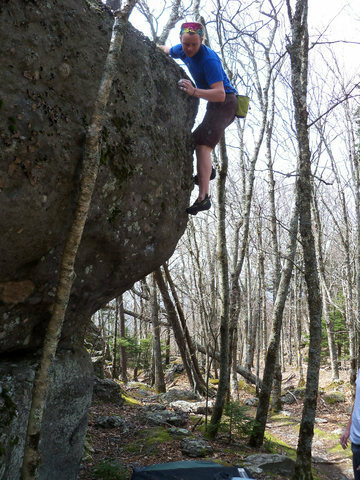 Once there, a reach to the juggy top of the boulder and an easy (lofty) mantle finishes out the line. A few pads and some spotters go a long way on this one. The name of this problem and most of the other lines on this boulder relate to when the Rock House boulder was used by Native Americans as a home and shelter. 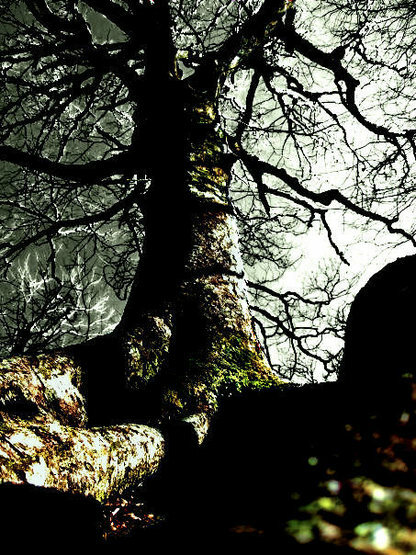 Logs were situated against the steeply overhung boulder and provided a nice place to live and escape the often harsh weather of the region. I’m sure they put up the first ascents of all of the most classic lines in the Grayson Area too. 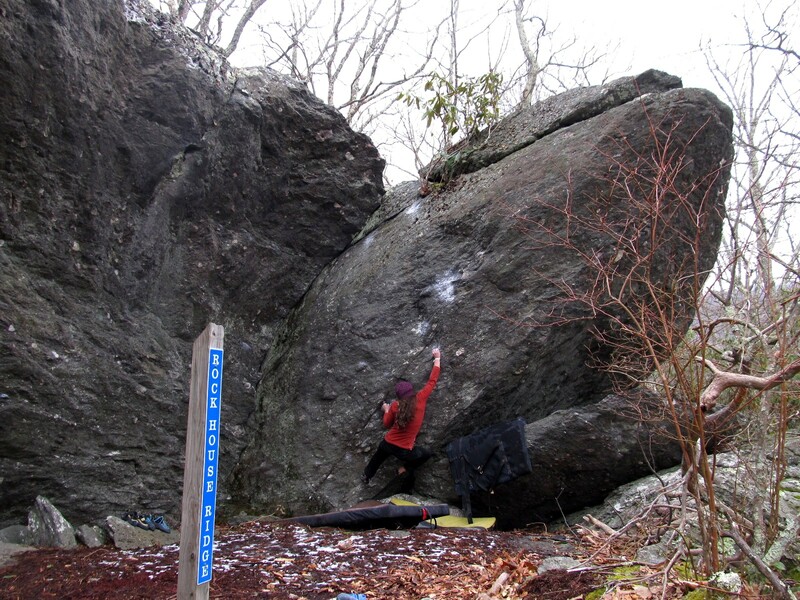 “Slabacious”(V0) is in the spotlight for this week’s POW (Problem Of [the] Week). This overlooked but exciting problem in the gorgeous Highlands Area of GHSP deserves some long overdue notoriety. Slabacious is a tall, featured (but not TOO featured) slab/dihedral located on the prestigious Highland Highball boulder. First off, any climb on this boulder gets an instant star for aesthetics simply for being located where it is. Situated in what is easily the most beautiful landscape VA has to offer, almost any problem gets my vote for at least one star (if you’ve been there I know that you are nodding in agreement). Secondly, the height of this one and the “scary but fun” factor probably constitute adding one more star. I wouldn’t really go beyond that though. 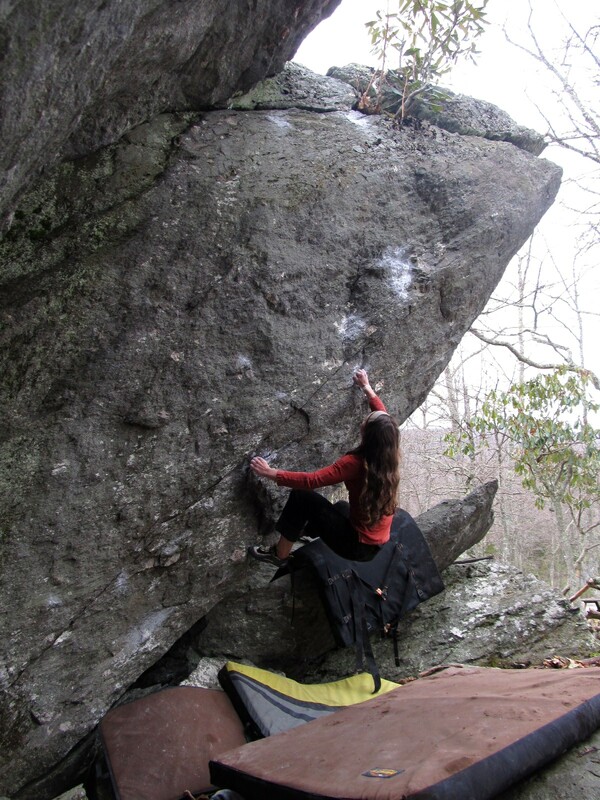 Certainly being just left of what is the best V2 in GHSP (or Virginia as a whole) “The Highland Highball” makes Slabacious a worthwhile climb to run up. Slabacious stand-starts in the noticeable dihedral that is a few feet to the left of the “Highland Highball” and is fairly difficult to protect with pads (but having a couple on the ground is necessary for sure). The start and mid section of the line are mostly easy-going with tiny, slopey, angular edges to press and pull off of. About three-quarters of the way up a couple tricky maneuvers (and the use of the left wall) lead to an airy reach above to the juggy top edge of the left dihedral face, giving way to the easy-ish topout. Once you find yourself at the top of this boulder you realize why this climb, along with most any other climb in the Highlands, is so dadgum perfect. 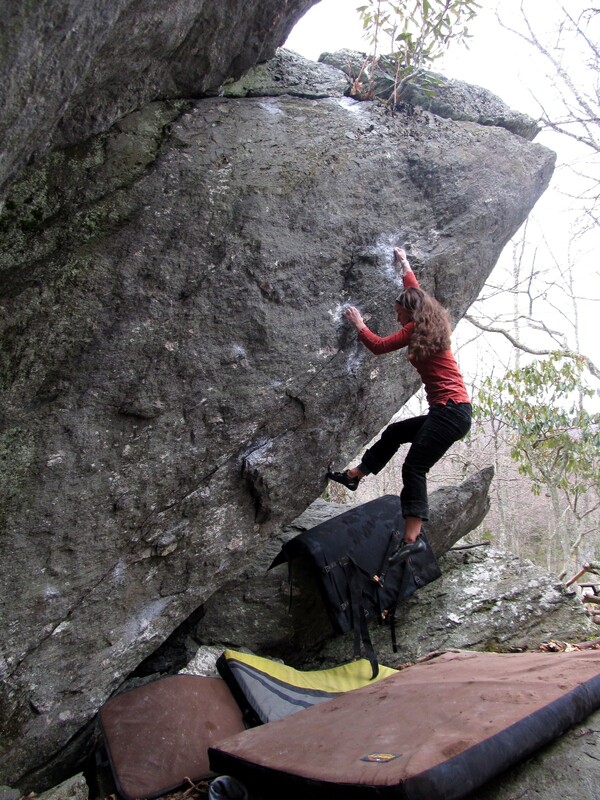 Windswept views overlooking miles of open Appalachian Mountain ranges, boulders and rocky peaks in every direction, PONYS, and a sense of awe that any climber will experience make this problem pretty rad. Be sure to give it a go whether this is your warm-up or hard climb for the day!